As small restaurants tend to do, the shutters on "Mariam Restaurant" went down for about a week, then suddenly a new awning was delivered, a few new tiles laid down inside, and a new name. It used to have a significant bent towards the Republic of Guinea, but now the proprietor was very adamant to say "West African" when I inquired. The menu was about the same, with a few additions that seemed like adapted Caribbean dishes, maybe an attempt to gather a little more business from the neighborhood. The board outside advertises $6 lunch specials, and these prices were honored at 16:00 when I strolled in one day. What you get for these special prices is a gigantic plate of food that you will not come close to finishing. The thiebu djeun ($8 at lunch, below) is an extra $2, and served much like in Senegal with fish on top of rice (the translation simply means "rice and fish") flavored with tomato sauce. It comes with boiled vegetables and all in all is about the definition of home cooking. When we asked the person working there what his favorite item on the specials board was, he quickly said the curry chicken ($6 at lunch, below), so we went for that. 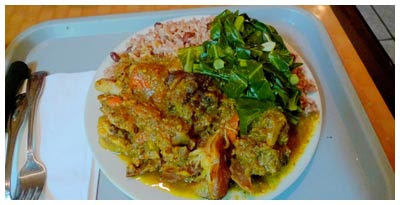 It was very similar to a Jamaican style dish, complete with the rice and peas, which is rice stewed with beans and coconut milk to make it sweet. The dish was good, but I would stick to some of the nearby Jamaican restaurants in the future and stay with the West African fare here. Once Mariam, now Adama, still a friendly, neighborly restaurant to enjoy a well-priced, good value meal that will leave absolutely no room in your stomach. That food looks excellent. I've set out in search of the best restaurants in nyc or any great food for that matter. Although I'm more of an asian cuisine restaurant aficionado i'll definitely make an effort to go check this place out. Thanks for the review - Keep 'em coming!